Could Planet of the Apes actually happen? Many people have seen the popular Planet of the Apes series and have asked themselves, could this actually happen? With how similar human and ape seem to be, it doesn’t seem too far-fetched that with the studies and experiments developing primates’ intelligence, they could come to a point where they reach close to the human intelligence levels, maybe even enough to realize they could most definitely be the superior race. Us humans are only a few genes away from our primate counter parts, showing that if we were to try to engineer apes to increase their intelligence, they could quite possibly develop into something very close to human, only stronger. The more we research into apes the more we find they are more like us than we think. A group of chimpanzees in the Zambian sanctuary have established a sort of “fashion” trend. One of the female chimps in the sanctuary stuck a piece of grass in her ear and eight of the 12 chimps in the sanctuary copied her. 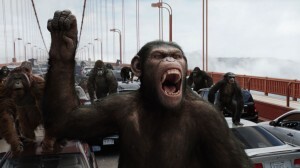 The apes continued on the fad even after its creator passed on. These actions could possibly show a culture that differs among where the apes are or what groups they are in. Apes are complex beings with social structures that differ throughout the different types of apes. Apes have also come to develop themselves throughout time like us. Stone tools have been found buried in Brazil, West Africa and Thailand. The archeologists who found these tools realized that they were in fact made and used by apes. People who have seen this information question whether the apes have entered to stone age. This was a vast discovery knowing that just a few decades ago we thought that we were the only species that used tools. But why did humans enter the stone age so much quicker? Why did we develop the tools into more complex and usable things unlike the primitive rocks that chimps use today? This is mostly credited to our larger brains which is why we are smarter and what helped us progress our tools. In summary, a lot of genetic engineering over a span of many years would have to go into apes to successfully make an ape who is almost as smart as a human. Also, a worldwide pandemic that wipes out most of the planet would have to endure if apes were to take over the world because we currently outnumber them seven billion to about 500,000, and their populations continue to decrease. So all in all, most scientist would say although it is not impossible, it is very unlikely that humans can engineer apes to become intelligent enough to stage a revolution and take over the world. Phew. This entry was posted in Uncategorized on December 2, 2016 by cmv5298.